The City of Shoreline has recently contracted with a new landscape maintenance company to address vegetation growth along Aurora Avenue. Unfortunately, the company originally contracted with to provide those services broke its contract at the beginning of the growing season. The City has been scrambling ever since to find a contractor to take over the work. This is why many of the landscaped areas in city right-of-way are overgrown. The new landscape maintenance company will provide services along Aurora for the rest of the year. Aurora should be back to looking like it should as soon as the new company has completed its first maintenance-cycle by late June or early July. “The current condition of the landscaping along Aurora Avenue is not what any of us in the City or the community want to see,” stated Utility and Operations Manager Lance Newkirk. While unable to address landscaping along Aurora for the rest of the year, the City has not been able to find a contractor for the other areas of the city in need of landscape maintenance. In the interim, the landscaped areas formerly serviced by private companies are receiving maintenance by a combination of temporary seasonal help and full time city staff. "In the long-term, we are reviewing our approach to landscape maintenance services and exploring ways to improve this valuable community service." Edmonds never has this problem. 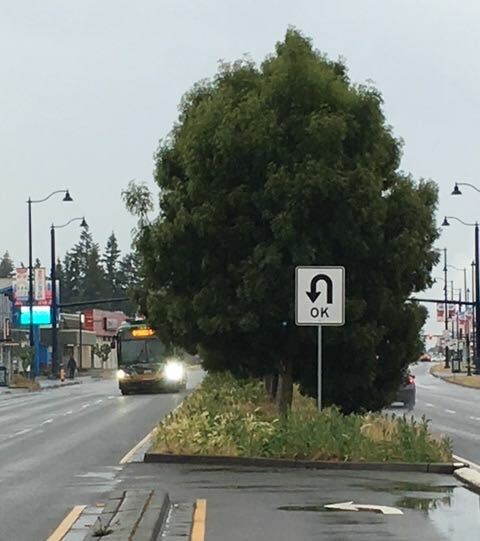 Actually, the way Aurora was before Shoreline, in their infinite wisdom, decided to waste tax payers dollars on a redesign, never had this problem because it didn't have weeds planted in the center of the road where cars belong. I remember when the push to upgrade Aurora was debated. We invested sooo much money and in just a few years this is what it looks like. The same has taken place at Shorewood. Drive around Shorewood and look at all the weeds that have smothered the expensive planting. Why invest so much money in landscaping only to have it go to weeds? Aurora's weeds are currently dangerous. They block your vision when making a left in a left turn lane. Kill the weeds. Pour in gravel. Admit defeat. Save that money for the sidewalks that are now being discussed. It is amazing how much we're paying gardeners in the middle of the street and how many potholes are going unattended. Does anyone else see something wrong with this?